Summertime and Imperial Stout beer—on the surface I’ll admit that doesn’t seem right. But sit outside on a cool evening, toss in a campfire and pop this one open; it’ll all make sense then. (There’s a bonus if you just got back from a nice mountain bike ride.) This is exactly my plan when I head to the epic trails at the Mohican Wilderness in a couple weeks with my annual late-summer camping group. Camping and smoked beers go together perfectly, and I always try to string together a few to enjoy with the group. This year’s flight will have Evil Twin Ashtray Heart positioned confidently in the anchor position. This, my friends, is how you finish a smoked beer tasting. Good smoked beers are difficult to find. I like them well enough that I endure my share of failed trials, and it seems that for every jewel I find there are five rather horrible efforts. Smoked beers can’t be faked and can easily be overdone, masking the beer with a latex-like overtone that can’t be ignored. Evil Twin out of Copenhagen has cracked the code. 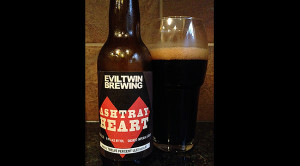 This is as close to a perfect smoked beer as I have found. I place it firmly at the top with my long-term favorites from Brauerei Heller (see my review of their smoked Dopplebock here). In fact, I’ll probably start this year’s summer flight with Heller’s fantastic smoked Marzen. Anyway, back to the Ashtray Heart. This one pours pitch black with a dark tan head. Like many Imperial Stouts, the head retention isn’t great. There is a subtle hop profile to the beer that I can’t quite put my finger on. It is balanced with strong coffee notes and, of course, peaty smokiness. There is sweetness in the aroma that is immediate with plenty dark chocolate. Very nice, and even better when it comes up to about 45 degrees F. Flavor is lots of dark and sweet malts, abundant coffee, and a nice dry smoked finish with some lingering bitterness. This one is a touch on the lean side for an Imperial but it all seems to work, with excellent balance start to finish. I highly recommend this one, regardless of the weather. Cheers!